Passage of the Tax Cuts and Jobs Act in the waning days of 2017 may have felt like a rush job. But the Act’s core elements were nearly a decade in the making, thrust into the realm of political reality by the 2016 election. The corporate tax changes may be most transformative, as the prevailing corporate rate falls from 35% to 21%, and the U.S. transitions to a territorial rather than global system for taxing profits. Those changes are designed to boost U.S. attractiveness to global capital investment. Since the Act’s passage, a host of major companies have announced employee bonuses, wage and benefit enhancements, and/or U.S. expansion plans. Many economists boosted estimates for near-term growth, and the market rally saw another leg up. Long-term effects will be hotly debated, but for now, we turn to the changes that may affect your personal tax and investment planning. The Act makes only slight changes in the personal income tax rate structure. Generally, the six brackets above the 10% rate edge down a point or two, while the thresholds to reach those rates bump higher. The top marginal rate drops from 39.6% to 37%, applied to joint taxable income above $600,000, or $500,000 for a singles. The law retains favored rates (0% / 15% / 20%) for long-term gains and qualified dividends. The income brackets for those rates are similar to those in effect for 2017. The 3.8% surtax on investment income also was retained. It applies to investment income that is part of adjusted gross income (AGI) over $250,000 ($200,000 for singles). If you own a business that flows profits through to your personal tax return (e.g., partnership, LLC, S-corporation, or sole proprietorship), the new law may allow you to deduct up to 20% of that net income. That can lower the top rate on those profits to 29.6% from 37%, a nod to employers who don’t benefit from the cut in the corporate tax rate. However, the deduction adds some complexity. For most personal service professionals the deduction phases out above certain levels of family income, while other limiting factors apply to other businesses. Tax specialists are seeking guidance regarding some ambiguity on these and other aspects of the pass-through deduction. For many, the biggest changes are the near doubling of the standard deduction and repeal of the personal exemption. With a standard deduction of $24,000 for couples ($12,000 for singles), some 25 million more taxpayers are expected to take the standard deduction, simplifying the process for them and the IRS. 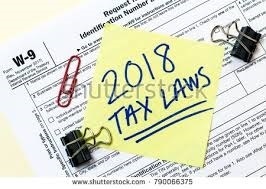 Repealing the personal exemption ($4,050 for 2017), while expanding the standard deduction and child credit, did complicate the reset of tax withholding rates. But Treasury released the new tables in early January, so most employee paychecks reflected the withholding changes by mid-February. The most popular itemized deductions remain, but some new limits apply. The amount of new home mortgage debt on which interest is deductible is capped at $750,000, down from $1,000,000. The allowance for $100,000 of added home equity debt is gone. However, the prior limits apply for financing in place before the Act’s passage. Most contentious of the Act’s provisions is the $10,000 limit on deducting state and local taxes. Some high-tax-high-earner states may try to restructure their levies to circumvent that limit, creating a new front for state-federal conflict. Charitable contributions remain deductible, but the larger standard deduction will remove the tax incentive for many donors. The inherent flexibility of charitable giving may facilitate the bundling of deductible expenses into one year, then taking the standard deduction the next. The Act eliminates the “miscellaneous” expense deduction, which comprised such items as unreimbursed employee travel and entertainment, union dues, tax preparation fees, etc. Relatively few taxpayers benefited from the miscellaneous expense deduction, as it was limited to the amount by which those items totaled more than 2% of AGI. During final deliberation on the tax bill, some in Congress argued for lowering retirement plan contribution limits. Those proposals failed to get traction, and contribution limits for 2018 were held at 2017’s levels or raised modestly. There is a change bearing on conversions of assets from Traditional to Roth IRAs. The Act eliminates the ability to reverse a conversion, a valuable backstop when a conversion turned out to have been ill-timed or ill-advised. The change raises the premium on careful analysis of the inherent trade-offs of any proposed conversion. The Act opens the door to using tax-free withdrawals for K-12 private school tuition from 529 College Savings Plans (up to $10,000 per year). Previously, only Coverdell Education Savings Accounts (ESAs) offered tax-free savings for K-12. In several respects, 529 Plans are more flexible than ESAs. The lifetime exclusion from federal estate and gift taxes has roughly doubled, to $11.2 million for an individual and $22.4 million for a couple. Also, the annual exclusion for individual gifts has been raised to $15,000 (per individual) for 2018, and it’s set to be indexed for inflation in future years. Older taxpayers are less likely to have been itemizers, so many will benefit from a higher standard deduction. Congress kept the added standard deduction for those over 65, set at $1,600 for singles and $1,300 for each spouse in a married couple. For many seniors the much higher standard deduction will more than compensate for the elimination of the personal exemption. If you are over 70½ you may want to consider the opportunity to have IRA withdrawals go directly to qualified charities. Those transfers do not count as taxable income but do help satisfy required minimum withdrawals; an effective deduction without itemizing. It also can help reduce those Medicare premium surcharges tied to higher income. The Act eliminates the deductibility of alimony payments, and it also makes those payments nontaxable to the recipient. But it’s not quite as simple as that, which prompts one last thought. As we all work through the process of filing our 2017 returns under the old law, it is not too early to consider how the new regime affects us for 2018. Your tax and investment professionals can lend a hand. Plan it Forward.